Federal regulators had already been working on new safety rules for offshore drilling when an oil rig exploded off the Louisiana coast this week, the latest and most glaring accident in a string of dozens of deaths and hundreds of injuries in the industry over the last several years. The U.S. Minerals and Management Service documented more than 1,400 offshore oil drilling accidents between 2001 and 2007. It's developing regulations aimed at preventing human error, which it identified as a factor in many of those cases. What caused Tuesday's massive blast off the Louisiana coast is unknown. On Friday, Coast Guard officials suspended the three-day search for 11 workers missing since an explosion rocked the Deepwater Horizon, saying they believe the men never made it off the platform that erupted into a giant fireball. Environmentalists say that while new technology touted by oil industry executives continues to improve, people still have to oversee those devices and human error remains a widespread problem. "You can't outlaw human error," Richard Charter, a senior policy adviser with Defenders of Wildlife, who has been involved in drilling issues for 30 years, said of Tuesday's explosion. "It's one of the sidebar issues now emerging for the Horizon incident - these are common incidents and this was just a bigger one." Opponents of President Barack Obama's plan for more offshore drilling say the explosion should be taken as a warning. "I would hope it would serve as another wake-up call on this issue that there is no such thing as safe oil drilling," said Sara Wan, a member of the California Coastal Commission, a state regulatory agency. "Once that oil starts leaking in the ocean, that damage is irreversible. You just look at what happened with Exxon-Valdez - they're still feeling the effects of it." Mr. Obama showed no sign of budging Friday. Spokesman Robert Gibbs said the president still believes increasing domestic oil production can be done safely, securely and without harming the environment. An undetermined amount of oil has spilled from the Deepwater Horizon. The sheen appeared to cover an area about two miles wide and eight miles long Friday afternoon, said Petty Officer Ashley Butler of the Coast Guard. The decision to call off the search for missing workers was made after the Coast Guard called their families. "I'm a father and husband, and I have done this a few times before. It's never easy. Your heart goes out to these people," said Coast Guard Capt. Peter Troedsson, who talked to the families. The Coast Guard says it will resume the search if any ships in the area see anything, but the workers' chances of survival had seemed slim well before Friday afternoon's announcement. "The time of reasonable expectation of survivability has passed," Rear Adm. Mary Landry said. Scott Bickford, a lawyer for the family of missing worker Shane Roshto, said Roshto's wife, Natalie, had been staying with other workers' relatives at a hotel in suburban New Orleans but returned home to Liberty, Mississippi, on Friday morning. "Natalie has pretty much accepted the fact that her husband is not coming back," Bickford said. As the search was ending, oil company crews were trying to clean up the environmental mess created by the Deepwater Horizon, which finally sank Thursday. The other 115 crew members made it off the platform; several were hurt but only two remained hospitalized Friday. The most seriously injured worker was expected to be released within about 10 days. The rig was the site of a 2005 fire found to have been caused by human error. An MMS investigation determined that a crane operator on the rig had become distracted while refueling the crane, allowing diesel fuel to overflow. Records show the fire was quickly contained, but caused $60,000 in damage to the crane. 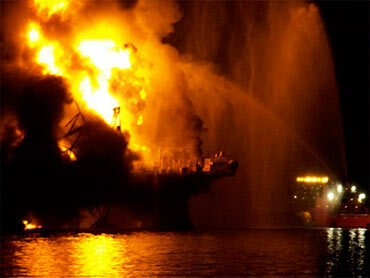 An MMS review published last year found 41 deaths and 302 injuries out of 1,443 oil-rig accidents from 2001 to 2007. An analysis of the accidents found a lack of communication between the operator and contractors, a lack of written procedures, a failure to enforce existing procedures and other problems. "It appears that equipment failure is rarely the primary cause of the incident or accident," the report said. As a result of the findings, the MMS is developing new rules that would require rig operators to develop programs focused on preventing human error, an area that received relatively little attention in the past. The agency, which has yet to implement the new rules and is currently reviewing public comment on the proposal, also suggested audits once every three years on programs to prevent human error. "We believe industry's current safety and environmental statistics demonstrate that the voluntary programs implemented ... have been and continue to be very successful," said Richard Morrison, a vice president with BP America Inc. in a September letter opposing the proposed rules. Rear Adm. Landry said no oil appeared to be leaking from a well head at the ocean floor, nor was any leaking at the water's surface. But she said crews were closely monitoring the rig for any more crude that might spill out. BP, which is taking the lead in the cleanup, said it has activated an extensive oil spill response, including using remotely operated vehicles to assess the well and 32 vessels to mop up the spill. The Marine Spill Response Corp., an energy industry cleanup consortium, also brought equipment. About half a dozen boats were using booms to trap the thin sheen, which extended about seven miles north of the rig site. There was no sign of wildlife being affected; the Louisiana coast is about 50 miles away.